GERMAN film-makers' quest for the Holy Grail brought them to Royston Cave in search of clues left by the Knights Templar. The film crew from state TV channel ZDF  the German equivalent of the BBC  visited the cave last Friday to examine carvings by the Templars, who were warrior monks thought to be the guardians of the Holy Grail. Peter Houldcroft, manager of the caves, said: "The cave is completely man-made and it has been believed for some time that there was somebody connected to the Knights Templar who carved the cave. 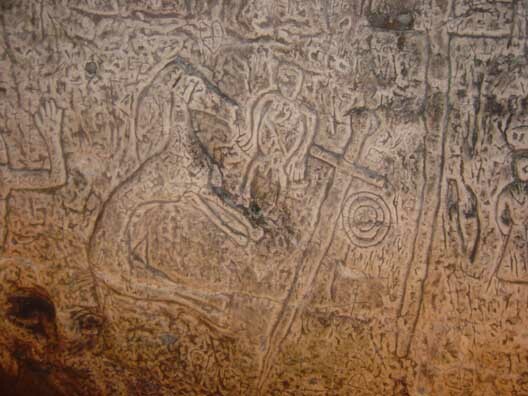 "The appeal of the cave is that there are medieval carvings with Masonic connections. "It was a place where the Templars carried out their rituals and it proves that the Templars who were interested in the caves had esoteric ideas and they used the cave for some kind of initiation rite." The cave and its medieval paintings have been a source of fascination ever since they were discovered in August 1742, when amazed workmen discovered a shaft leading into the chalk behind a buried millstone. The phenomenal success of Dan Brown's best-seller The Da Vinci Code has rejuvenated interest in the Templars, with speculation that there are clues dotted around the county leading to the Holy Grail. ZDF producer Yacin Hehrlein said: "The cave was a fascinating place to film. "I am incredibly impressed with the structure and it will look good on film. As for the Holy Grail being there  who knows? "I'm sure that our millions of viewers will be fascinated by the cave and you may see a bit of a surge in tourists from Germany and from France coming to visit Royston." ZDF's programme Art: Fairytales and Myths has also taken in Hertford. Four Knights Templars were imprisoned in the town's castle after they refused to reveal the whereabouts of the grail to King Edward II. And the Germans also visited St Andrew's Church in St Andrew Street, Hertford, to film a stained glass window claimed to hold a clue to the grail's location. Mr Houldcroft said: "I don't believe for one minute that the Holy Grail is in Royston. And I don't believe that anybody else takes it seriously. "The tour guides have joked about putting a sign outside saying 'Grail hunters, leave your spades outside'." Thank you for those terrific pics. I had been wondering what the cave looked like. You're mighty welcome. It is a very strange structure indeed. Note: this topic is from 11/18/2005. Thanks BlackVeil.